Note: Using candles and highly flammable plastic together is probably a really stupid idea. I'm not responsible if you burn down your house using this. YOU HAVE BEEN WARNED.For the Jewish holiday of Hanukkah, the festival of lights, one traditionally lights candles for eight days -- one on the first day, two on the second, etc, using a ninth candle, called the shamash. A device called a Menorah is used to hold the candles, and to keep the shamash seperate. (The shamash isn't one of the holy candles, but rather is there so you have an excuse when you use the light of the menorah for mundane tasks, instead of studying and spreading the story of Hanukkah. )You may want to edit menorah.scad to change candle_r and candle_h to suit your candles (give some extra room in candle_r, to make them reasonably easy to put the in and out). 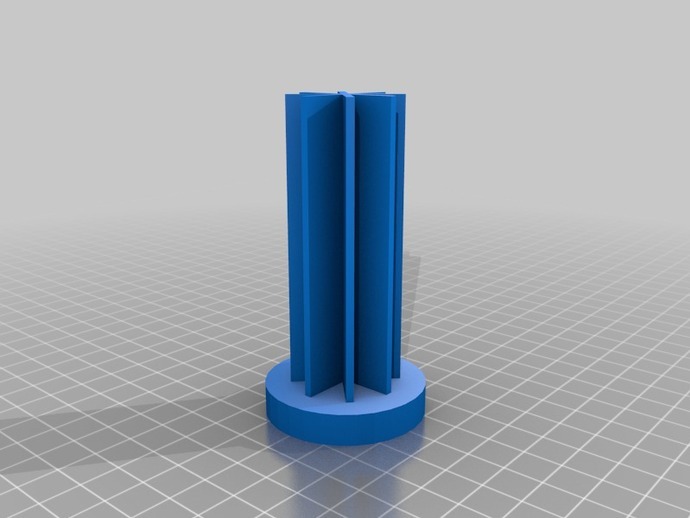 holder_rim and holder_bottom should be changed according to your printer, and possibly your plastic - they are the width of the rim around a candle, and the depth of the bottom. (My first print-out of the arm has a somewhat too low holder_bottom for my printer, which isn't all the great, which is where the brown, burnt-looking bits of the bottom of the candle-holder shown come from -- they aren't from the candle, they are from the printer.) holder_space and arm_length are largely a matter of taste. Holder_space is how much space each arm takes on the central shaft, and arm_length is the distance between the edge of the center "nut" and the edge of the candle holder. Note that too small an arm_length may allow one candle to heat another candle holder.Print out one "center", one "arm" per day, and one "shamash_holder". Put the center on your table, shove an arm on top of it, and stick a candle in it. Shove the shamash holder on top of the center piece. Light them, say your prayers, and hope it doesn't melt or catch fire.This has been tested, with only one arm and no shamash holder, but allowing the tea candle to burn all the way down to itself. Sorry we had trouble getting the 3D files. Download them yourself and upload them here to place an order.